High blood pressure clinical studies of sorts date back to the 6th century B.C. Some have even argued that there is evidence of it being documented going back to the 2nd century! Unfortunately, all of those studies have not yet resulted in a definitive way to diagnose, treat and ultimately cure high blood pressure. It is an often overlooked and underestimated disease. If you are one of the millions of Americans who suffers from high blood pressure, please review the list of current high blood pressure clinical trials. Your participation could help us make the next big discovery in treating high blood pressure. Participation in clinical studies is always at no cost to you. High Blood Pressure, or Hypertension, is a condition that develops when the heart is forced to pump harder to maintain proper circulation. Unfortunately, given how common this disease is, the symptoms may be easy to miss. There are two main types of hypertension – primary and secondary. Primary hypertension accounts for approximately 90 – 95% of the cases and no cause can be found for these cases. Secondary hypertension is the other 5 – 10% of the cases. These are diagnosed as being caused by other ailments. 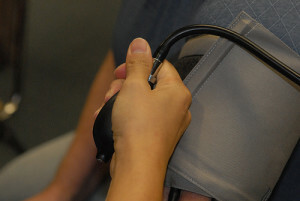 It is estimated that about 30% of the adult population in the United States suffers from high blood pressure, although not everyone manages it as a disease. Left untreated it can lead to a risk of stroke, heart failure, aneurysms, or kidney failure. Preventative treatments for high blood pressure include major lifestyle changes. Weight loss, exercise and diets lower in salt and sugar have been shown to be beneficial. The aim of drugs in treating high blood pressure is to reduce the blood pressure to a more normal state. This is often done with a combination of drugs that can include ACE inhibitors, alpha blockers and beta blockers.